Monday, after the terrific thunderstorm described in my last regular post, was a jour férié (holiday), the Monday after Pentecost. (You couldn’t make this stuff up!) I felt a bit under the weather, and hardly went out at all. I probably am working through some sort of bug, but it also seemed that there was a psychological aspect. In general I am thrilled by extreme weather: downpours, hurricanes, blizzards, etc. But the intense pelting of hailstones early that morning scared me a little. I wasn’t afraid for my immediate safety, but it seemed to me that someone caught out in that storm without a place to shelter could have been seriously injured. The forecast was for more thunderstorms on Monday, and I just didn’t feel like going outside! I did make a run to the grocery store, but just ate a frozen dinner at home. I did do one important thing on Monday: Our landlord in Cambridge had sent us a proposal for an 8% increase in rent. We are used to annual increases, but this was more than usual. I made an appointment for a Skype conversation and was pleased to have been able to talk the landlord down to an increase of less than 5%. My roommate and I promptly signed the lease electronically, so my happy home is secure for another year. I also spend some time with the book I’m reading for my book club, and I put up a post on getting into Paris. But I suppose that even a dedicated flâneur occasionally needs a day of rest! Tuesday was again rainy, but not as threatening, so I set out for the musée du quai Branly, which I had visited with my nephew Andy in 2008. It collects non-Western art that nobody today would ever dare to call “primitive.” Much of the collection was looted — I mean to say “collected” — from France’s far-flung colonies. The museum grounds are lovely. 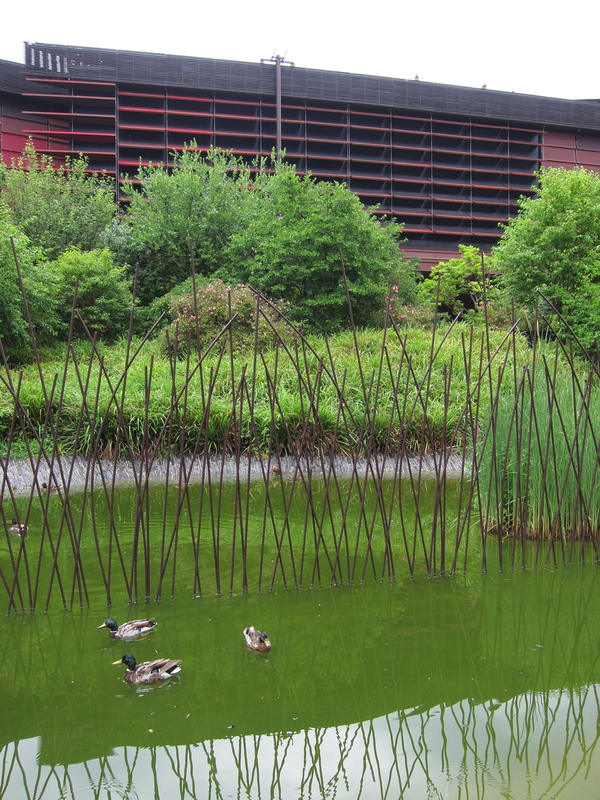 The grounds of the musée du quai Branly are lovely. The interior layout of the museum, however, is the most confusing of any museum I have ever visited. You never know where you are, where you should go next, and whether or not you have seen everything. I enjoy art-that-must-not-be-called-primitive in much the way I like contemporary art, because it sparks rich and complex feelings. I don’t really have an interest in memorizing which tribes particular types of masks come from, however. One Australian aboriginal painting especially appealed to me. 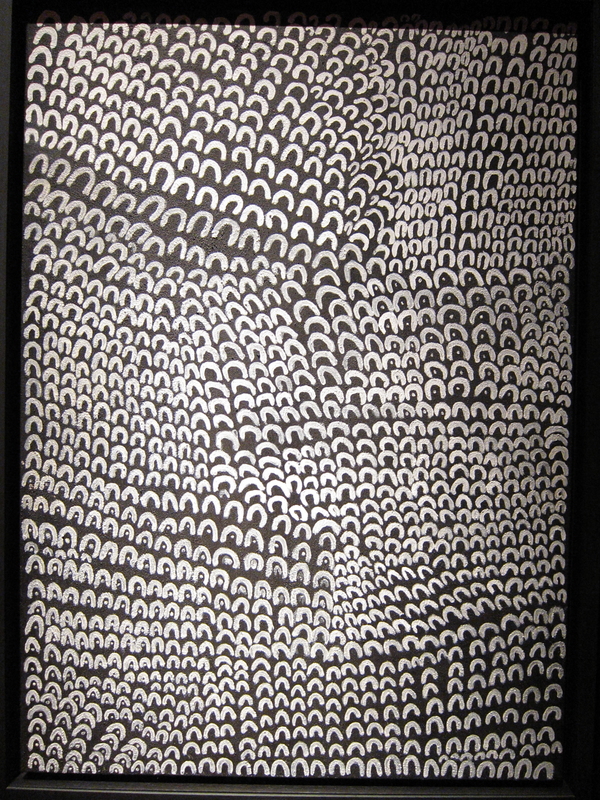 Dream of Barramundi Shells by Lena Nyadbi. 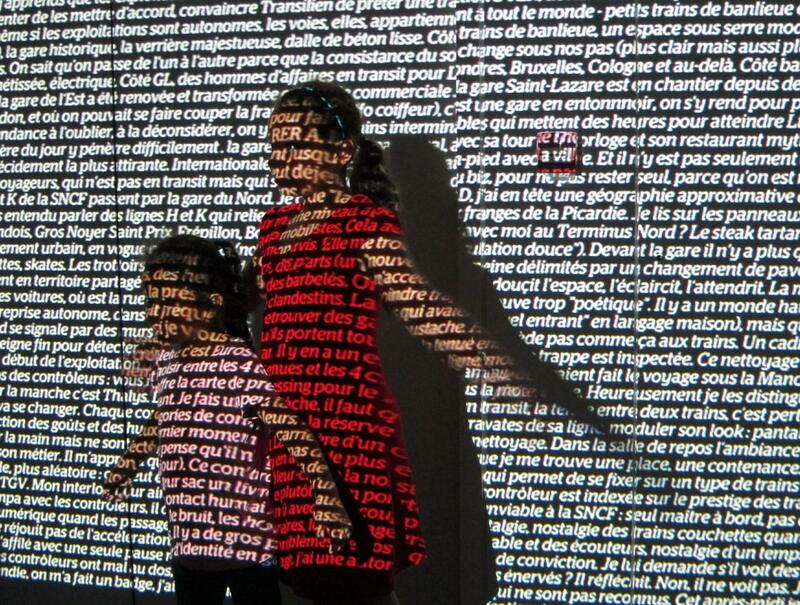 At musée du quai Branly. There were also two temporary exhibitions, one on the plains indians (which fascinate the French) and the other on tattooing. I was ambivalent about both, but found them worth a look. 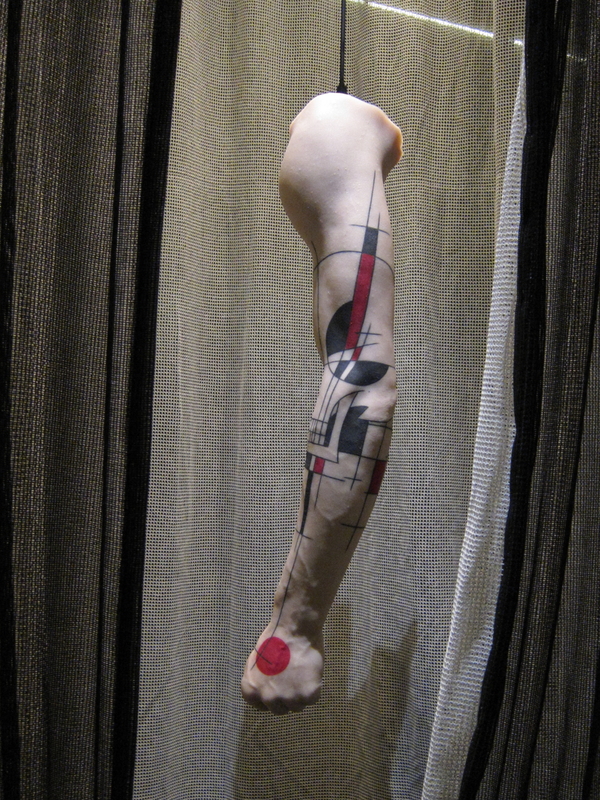 Latex model of a tatooed arm. At musée du quai Branly. Tuesday evening I got together again with Jacques, first for an apéro at my place, then for dinner at La Table des Gourmets in the Marais. The restaurant served good traditional French food but the truly amazing thing was the dining room, a 12th century underground chapel. 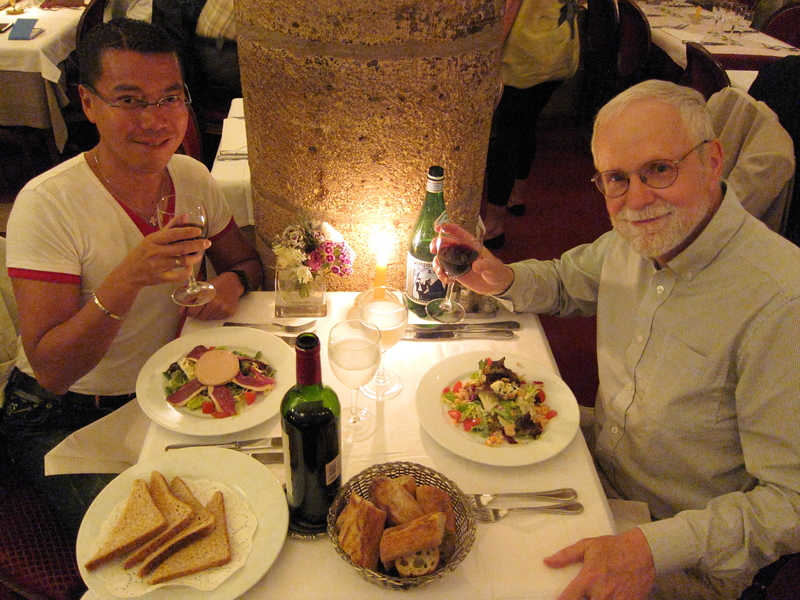 Jacques and Bob at dinner at La Table des Gourmets in the Marais. 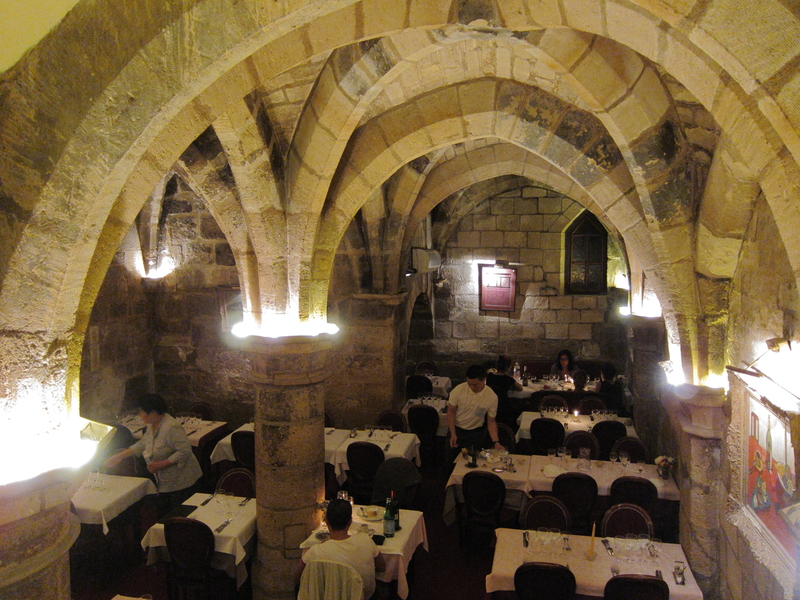 The astonishing dining room of La Table des Gourmets in the Marais was a 12th century chapel. It was a lovely meal, with a great friend. This morning (Wednesday) I set out to visit the medieval town of Senlis, but disruptions in train service changed my plans and I decided instead to go up the Arc de Triomphe, which I had never climbed in all my years here. Jason and I had been turned away in 2010 due to a demonstration (though we did see one of the demonstrators fall from the top, fortunately not to his death). You climb up a spiral staircase which makes for a giddy view. 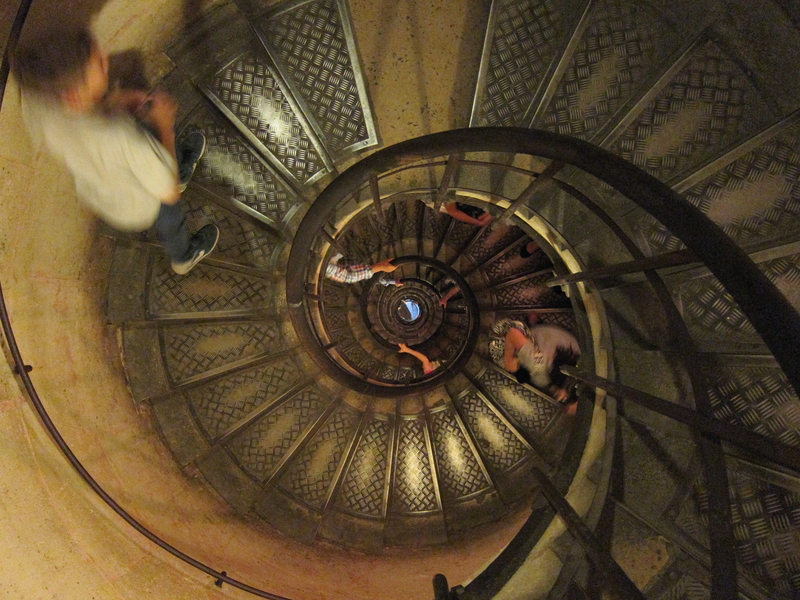 Stairway up the Arc de Triomphe. 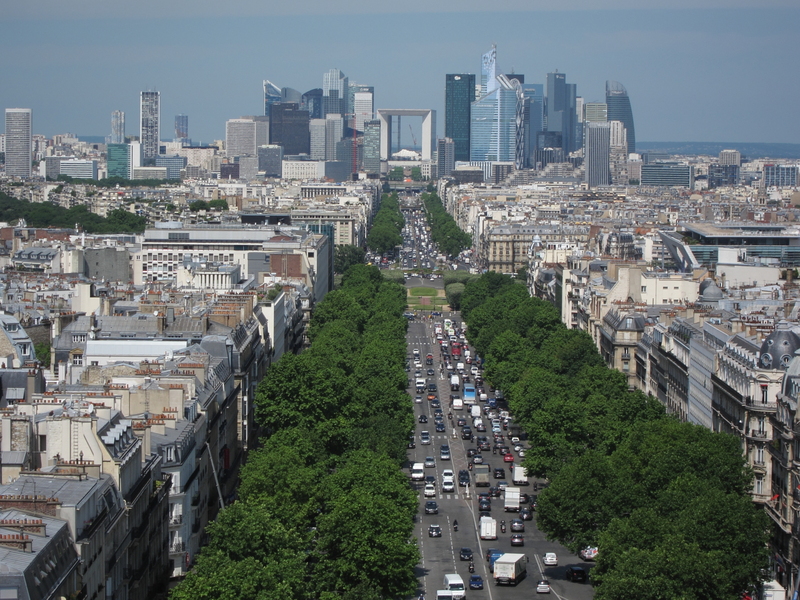 The most impressive view from the top is of La Défense, the modern high-rise cluster just outside the western boundary of Paris proper. La Défense from the Arc de Triomphe. 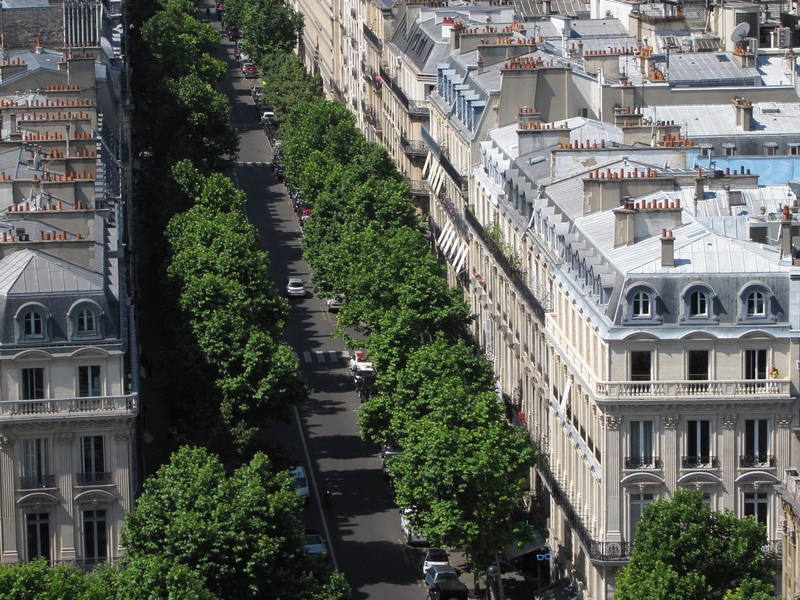 I was also intrigued by this perspective on the rooftops of a typical street of Haussmann buildings. Many flues on Haussmann building rooftops. Notice the narrow chimneys with many flues. You need one for each fireplace or coal stove, so even at just five stories that’s a lot of flues! 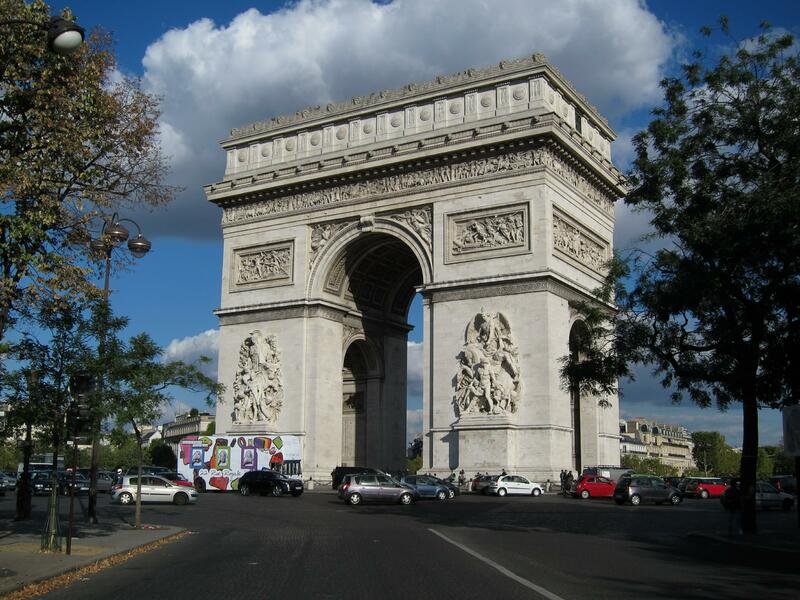 I had been traumatized in May by traffic in l’Étoile, the traffic circle that goes around the Arc de Triomphe. It turns out that most circles in France give priority to cars already in the circle, like everywhere else in the world, by specific signs. But the general rule in France is that the driver on the right has priority, and this still applies to l’Étoile. This means that drivers entering the circle have priority over those already in it. Not knowing this nearly got me into an accident! But when you understand the rule the traffic flow makes excellent sense, and is even surprisingly calm. Here’s a short video clip of traffic in l’Étoile. The militaristic sculptures on the columns of the Arc were being renovated the last time I visited, but are now good as new. Wimps sometimes ask why there are so many wars. Because they’re fun! 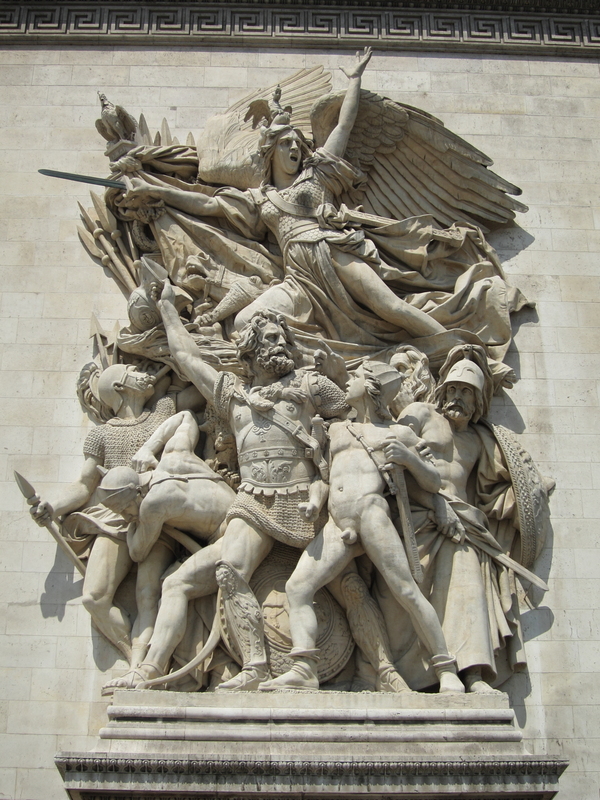 Sculpture on the Arc de Triomphe. If only he’d known when to stop! 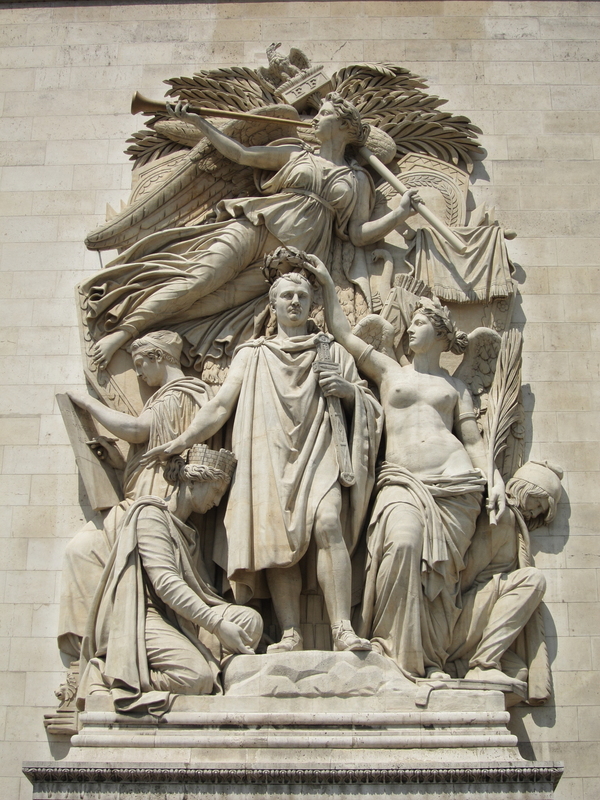 Victorious Napoleon on the Arc de Triomphe. Mot du jour: homo. Jacques explained to me that homo, which has insulting overtones in American English, is an inoffensive shorthand for “gay and lesbian” in French, similar to “gay” in American English. 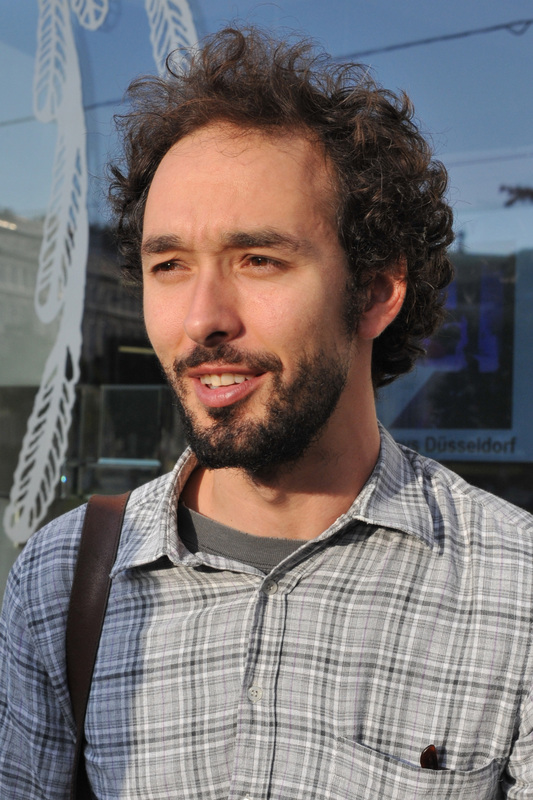 He also noted that in contemporary French gai still means happy and carefree, while gay means “gay male.” The rude term for gay in French is pédé, short for pédéraste. Wednesday evening I went to an indie movie, Lacrau, at Le musée de la Chasse et de la Nature, a quirky but interesting museum in the Haut Marais. The young Portuguese director was there, and when he took questions after the movie I was delighted to find that I understood everything! But only because his French is about the same level as mine. At the wine reception after the movie I had a nice conversation with him about, among other things, Henry David Thoreau. One of the director’s friends, also from Portugal, made an interesting remark. He has been living in Paris for four years, with his French girlfriend. He observed that the French are more like the Japanese than they are like Americans or other Europeans, in that they have an elaborate cultural code which is equally rigid, and equally difficult to grasp. I think he probably exaggerates, but the parallel is interesting, and might go some way to explain the mutual infatuation between France and Japan. I had learned about the movie from Lisa’s great friend, Eve Couturier. I had a brief opportunity to catch up with her, but I was sorry to learn that she will not after all be able to join us for Sunday lunch at Lisa’s. On Thursday, after blogging, I went to a matinée movie at a cinema in the sketchy Château d’Eau neighborhood of the 10e. I felt safe in the daytime but I would be cautious about going there alone after dark. I noticed that the barber shops were offering men’s haircuts for 8 euros, even less than I pay in Central Square! A few days before I saw that barbers in the wealthy 16e generally quoted around 31 euros. I wonder whether one could construct a useful socioeconomic map based on haircut prices? The movie was French Canadian, but mostly in English with French subtitles, so easy to follow. 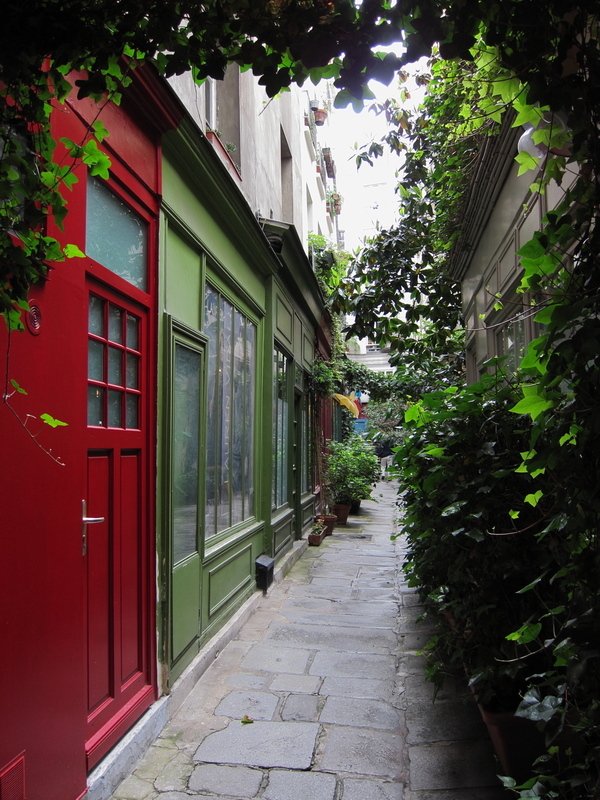 On the way back I detoured through the Passage de l’Ancre, one of the oldest in Paris, running between rue Saint-Martin and rue Turbigo. 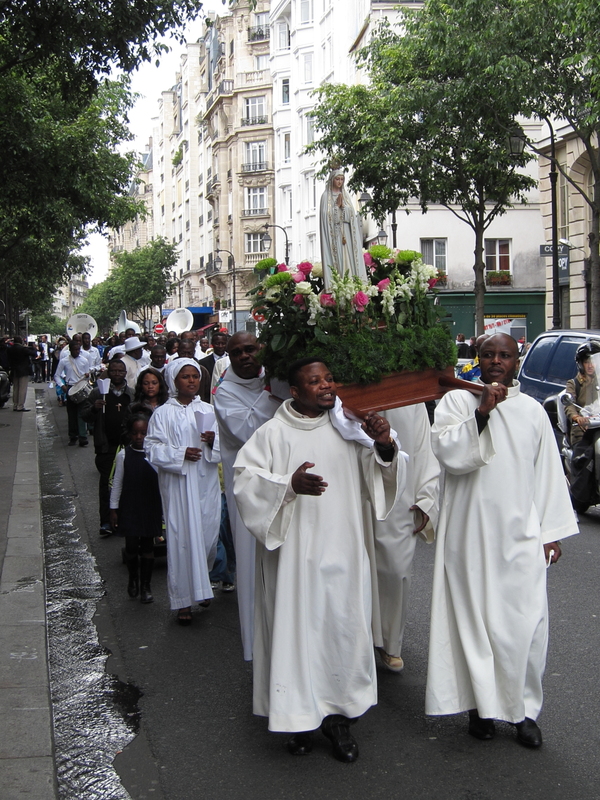 Thursday was a jour férié (holiday) for the Feast of the Ascension. Which, for those whose grasp of Christian rituals may be a bit shaky, is the day when Christ bodily ascended to heaven. It’s a French paradox that a country that fiercely defends laïcité (secularism) nevertheless recognizes many Christian holidays, including not only Easter but also the day after Easter. I followed the sound of a brass band and came across this procession, rather paradoxically carrying a statue of the Virgin Mary. Thursday evening I finally caught up with my first French friend, Jacques. 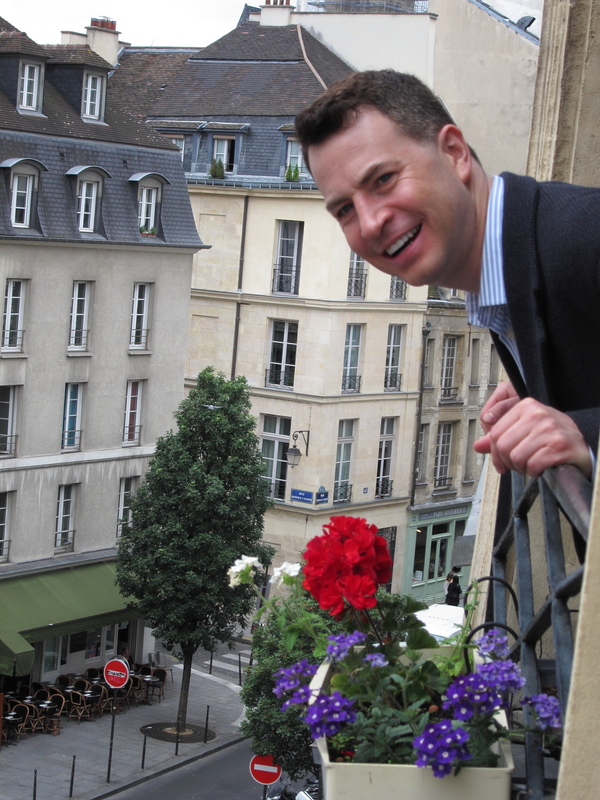 We had a couple glasses of rosé at my place, which he declared to be a classic Marais apartment. We had diner at a nearby Chinese restaurant where — as at so many places in the Marais — he is friendly with the owners and waiters. There — in addition to welcome and farewell cocktails — we had another bottle of rosé, in this case a “White Rosé” that was clear but with the distinctive rosé taste. At my request, Jacques made sure I got home safely! 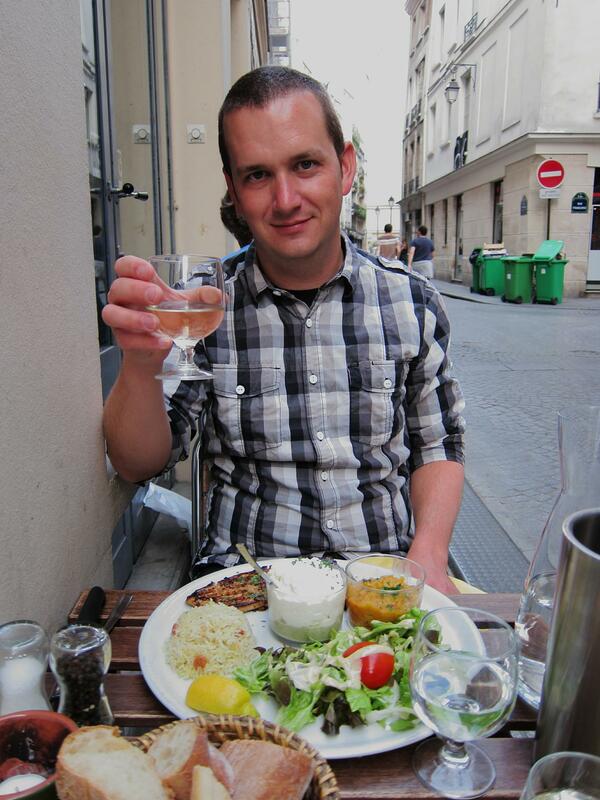 Jacques with a delicious bottle of White Rosé at Chez Tsou in the Marais. It was a real pleasure to catch up with him. We have been friends now for more than four years, despite the fact that our politics are completely opposite. Jason arrived on Friday morning, but since he’s here now we’re going out to enjoy the day. I’ll post more about his visit when I get a chance. Jason looking out the window of my 2014 apartment. 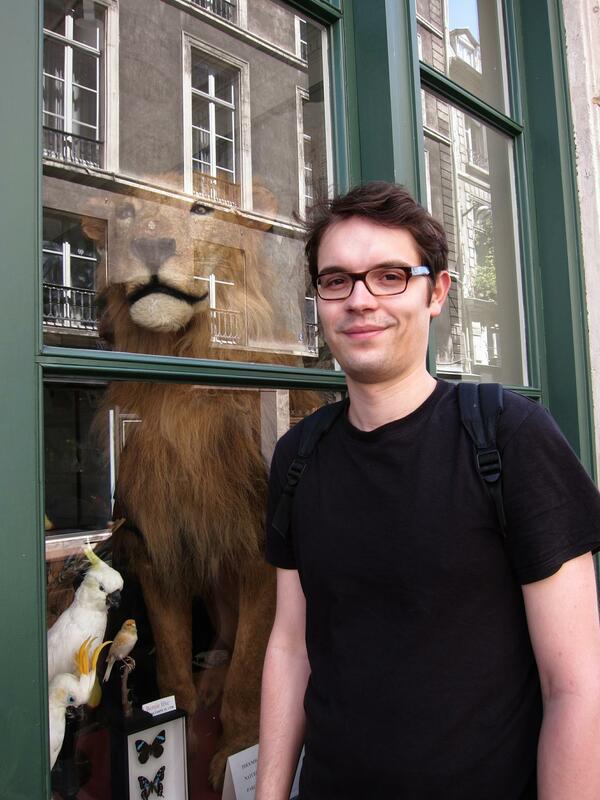 On Thursday I had lunch with my Parisian friend Antoine, but first we stopped by Design et Nature, a taxidermy shop in my neighborhood that I had posted about last month. It was closed — because Thursday was of course the day on which Jesus Christ ascended to heaven, which, despite France’s laicité, is a jour férié. It was fun anyway to look through the windows, and to compare the wild beasts inside with those outside. 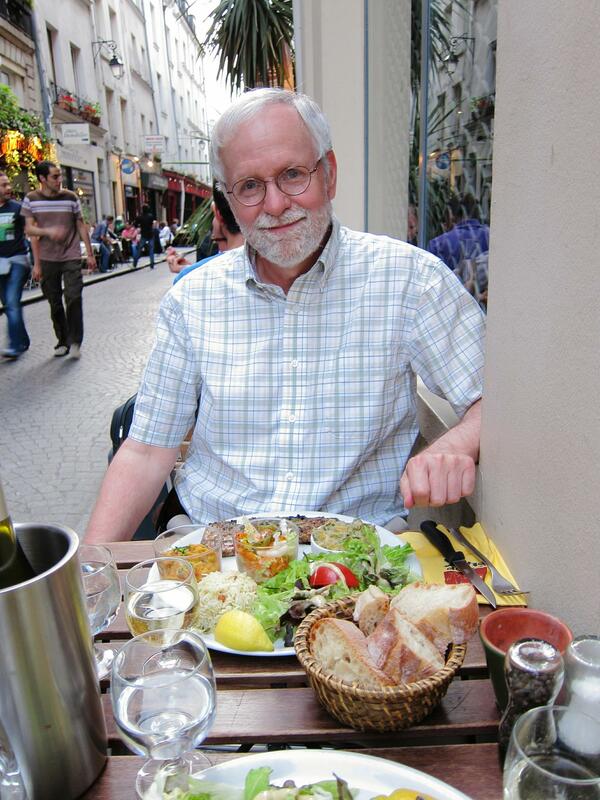 After lunch and a visit to my apartment Antoine rode home to Montmartre on a velib’ bicycle from the nearby stand. I got one too and rode with him a few blocks before we parted. 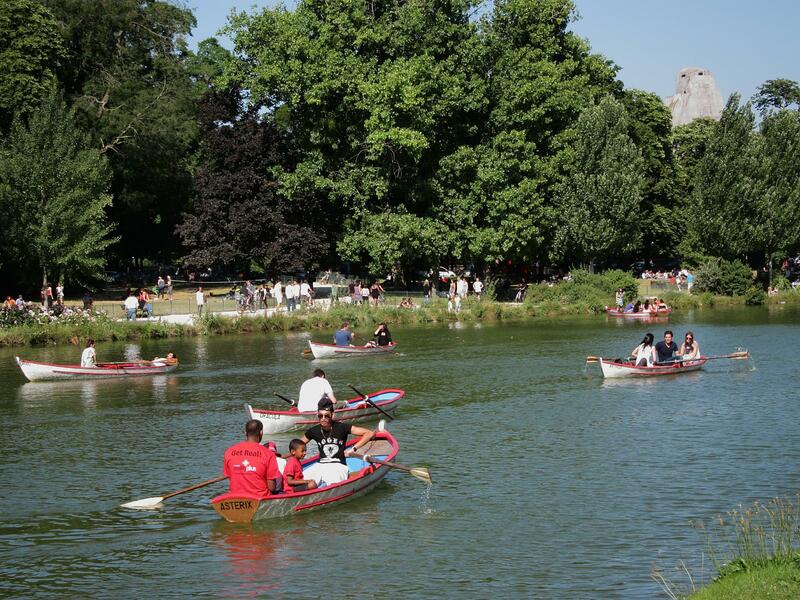 After a short ride and walk the sun was so pleasant that I decided to jump on the métro to the Jardin de Reuilly, my favorite sunbathing park. After soaking up a few rays I felt like some more bicycling, so I picked up another velib’. I saw a sign to Bois de Vincennes and thought, “Pourquois pas?” As it turned out there was a dedicated bicycle lane all the way! The park was packed — suboptimal for cycling — but the happy energy was infectious. There was a moment of frustration when I tried to return the bike at a velib’ station that was closed for construction, but my pocket atlas showed the location of another nearby velib’ site so all was well. I then caught up with Rafael and we joined an impromptu gathering of gay Harvard alumni and friends that I had stirred up earlier in the week. There were lots of surprising connections and interesting conversational topics. 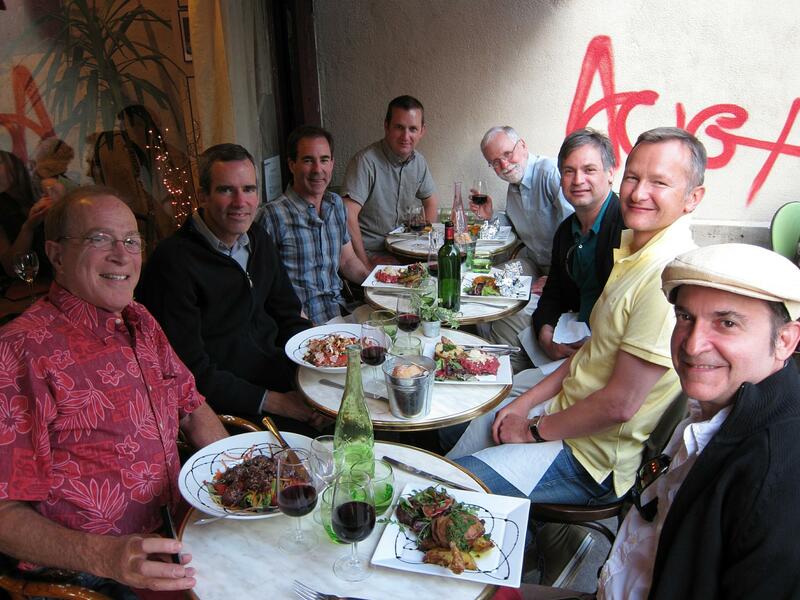 I hope to get together with some of these folks later in my stay, and I think friendships were struck also among some of the Parisian members. 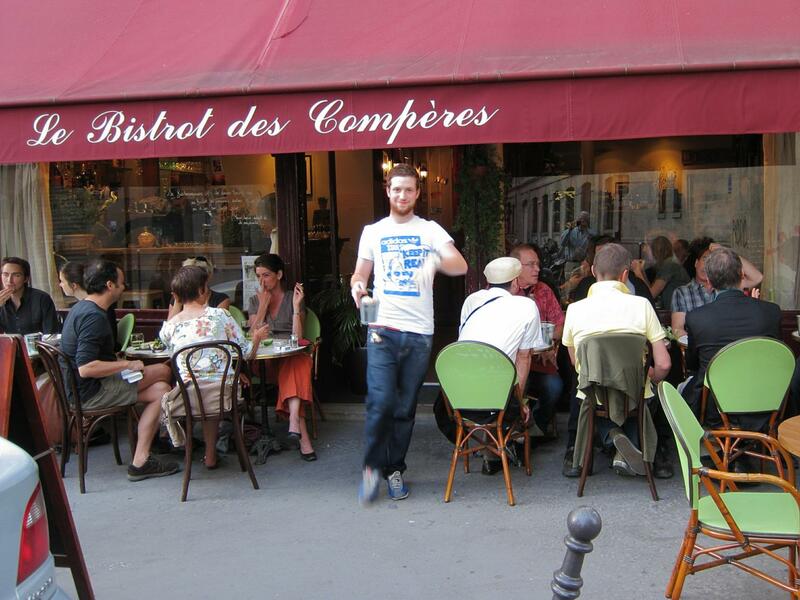 We ate at Le Bistrot des Compères in the Saint Paul area of the Marais. I was quite impressed with the food — and the service. After dinner Rafael and I had a drink at — you guessed it — the Open Café — with Steve Christiansen and his partner Jason, who runs a hedge fund. Jason has to work whenever the New York Stock Exchange is open, which means that he’s the early riser when they’re at home in L.A. but he works from 1 pm to 10 pm while they’re in Paris, and in the mornings is a flâneur like me. I got to bed around 1 am and Rafael set out to further explore the mysteries of the Parisian night. This morning was mostly taken up with Jaime getting packed. Then we took a last walk by the Seine. We sat for a while on the quai at the upstream tip of L’île Saint-Louis contemplating the sadness of his departure mingled with the pleasure of a wonderful stay and the calmness of a lovely Sunday morning. After wishing Jaime bon voyage I headed back up to the Montorgueil neighborhood to have brunch with Alexis, a friend of a friend who has just moved back to Paris after six years in the U.S. We had a great conversation and I hope to introduce him before I leave to some of the other folks I’ve met here. We were taken aback to discover that we had lived for three years within a couple blocks of each other in Central Square, Cambridge, without ever meeting. I spent the rest of the afternoon doing practical chores: shopping, laundry, etc. My usual boulangerie was closed (due, of course, to the fact that May 8 is the Fête de la Victoire 1945, one of those pesky jours férié) so I set out on an Odyssey in search of my evening baguette. Bakery after bakery were also closed, and I began to worry that I would go breadless! 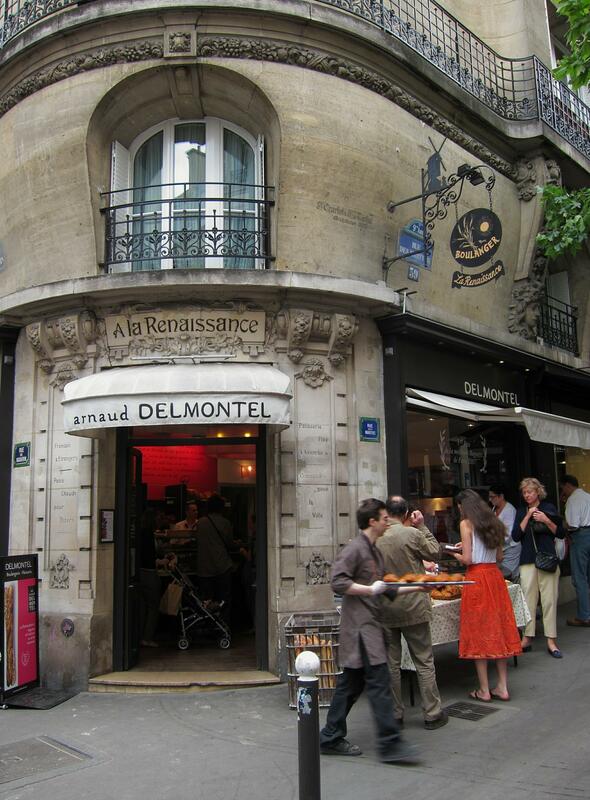 I did have to walk back up to Montorgueil but I got my daily bread, along with a concert from a sidewalk jazz band. The next few days should be rather quiet. Then Michael, my last visitor, will arrive on Thursday from Sweden for a long weekend. You might think that things would be back to normal today, mais non! Easter Monday is a holiday — jour férié — in France. I’ll be here for four more fêtes and jours de férié (ask me later what the difference is): Fête du Travail, 1 Mai; Fête de la Victoire 1945, 8 Mai; Ascension, 13 Mai; and Lundi de Pentecôte, 24 Mai. Who knew? It’s still chilly here but today was nice and sunny so I wandered over to the Marais to have a look. 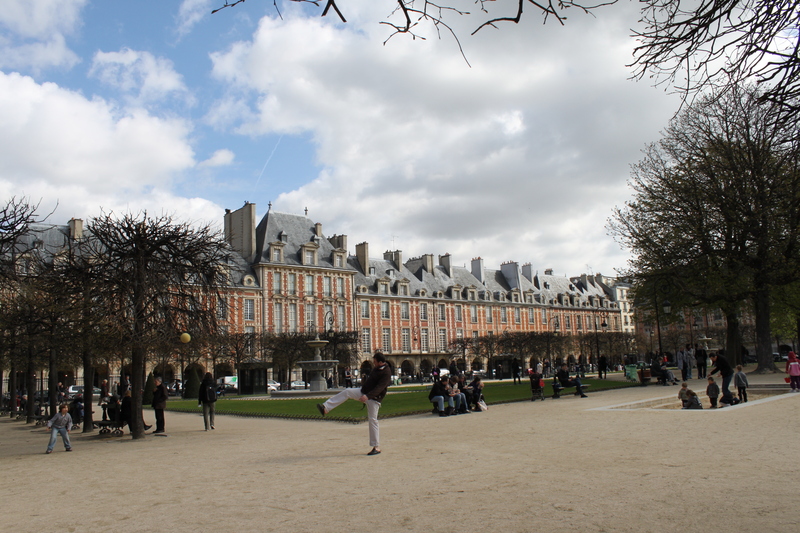 Place des Vosges was gorgeous and I sat there in the sun for quite a while just soaking up the ambiance. The happy strollers and loungers added considerably to the experience. There are art galleries on three sides of the square (the other is surprisingly derelict). Most, unfortunately, are aimed at obtuse tourists, but I quite liked the “brut” artist Noel H. at Galerie Lisette Alibert (2016 Update: Closed). Lunch was a delicious (and deliciously un-American) rabbit stew at a very agreeable little restaurant — Le Marché — in the nearby but well-hidden Place du Marché Ste. Catherine. After resolving a minor credit card issue (for which Skype came in handy) I went for a swim at the Olympic pool that is two blocks from my apartment. I’m not sure I would have had the nerve except for the fact that a friend had recommended it. The facility is very nice; it was a bit on the busy side but still quite a good experience. With pardonable pleasure I bought a ten-pack of pool admissions. I jokingly asked the young man at the desk whether there was a discount for old folks like myself; he said it was available only to people who resided in Paris, but then he smiled and gave it to me anyway. There’s also a 19-screen multiplex cinema in the same complex so I decided after my swim to see “The Ghost Writer”, which I had heard good things about. The art direction was good but the plot was dumb. By the middle of the film the Ewan McGregor character started doing stuff that nobody in their right mind would do. After my disbelief stopped being suspended I was pretty much tapping my toes for the rest of the movie. Just made plans for a drink with my next landlord tomorrow and dinner with my cousins on Wednesday. Full speed ahead!